Orchestra: 20, could definitely be done smaller, say piano, bass, percussion, and perhaps 4-5 others including a synth and some acoustic. Recordings: The original Broadway is good, though Chaplin always sounds stiff to me. As always, Holliday is a breath of fresh air. Film: Directed by Vincente Minelli. With Holliday and Dean Martin, sweet and fun, worth watching. Holliday was wonderful, Martin was good for the role. Awards: Both Holliday and Chaplin won Best Performer Tonys. It’s a large show, a screwball comedy with big dance numbers in “Bells Are Ringing”, “Simple Little System”, “Hello, Hello There”, “I Met A Girl”, “Mu-Cha-Cha” (danced originally by Peter Gennaro, who would become a famed choreographer), “Drop That Name”, and “The Midas Touch”. This is a dance show, and needs strong choreographic work. The lead role is massive, she carries the evening. She has a lot to do in way of singing, acting, and mugging. “Mugging” in theatrical terms means playing a comic moment way over the top, it does not mean beating up the audience. The actress playing Ella must be entirely lovable, sing with great personality and energy, and be as funny as it gets. The show requires a lot of sets, period costuming, dancers, singers, actors. It’s a large show. It would work best for High Schools with large theater departments, Colleges and Universities, Little Theaters looking for larger shows, some stock companies. I think it’s chances with pro theaters have pretty much passed it by. The only moral concern one might have about the show is that Ella works at an answering service and pretends to be other people, in order to find out about the people she takes care of. In other words, in modern terms, she’s a bit of a stalker. But the authors were aware of this possible interpretation, and they wrote her so she is filled with love and would never hurt a fly. We are more concerned today with privacy issue, than was the audience in the late 1950s, and we interpret actions based on our modern biases and concerns. But this is not a reason to avoid the show, as she is pretty lovable. The show is quite large, and hard to reduce down. It isn’t going to yield easily to a unit set, or a minimal cast size of 12, or something like that. It largely exists on spectacle, that is one of it’s real strengths. We are led through New York, meet all the nice, cheerful people there. (Yes, it’s intended to be a joke, in the number “Hello, Hello There”.) We meet all the seedy gamblers in “Simple Little System”. And we meet the snobby New York upper crust in “Drop That Name”. As was Comden and Green’s earlier “On The Town”, this show is a whirlwind visit to the Big Apple. That makes it a large show, no getting around it. If you haven’t the resources, money and wings and flies and dancers and some kind of orchestra, don’t bother. Also, your lead female is the star and the reason for the show to exist and be produced. Without an very strong Ella Peterson, this is not a show you should start. Promoting this show might be an issue, as well. If you look at most of the promo designs for the show in the past, they have usually focused on one of two things, either the star (as you see in the cast album cover pictured at the top of this page), or a phone and a girl image. So if you haven’t really a star, and as phones are, well, dinosaurs now, you’ll need to find a different way to promote the show. As it is all about NYC, and love, and parties, and parties ending, and Cinderella (basically), I would think this could be done, but it needs to be done effectively. If you have a star, promote her. You’ll make her happy and it will help your production. The office of Susanswerphone. Sue handles the incoming calls, but it’s clear everyone calling in wants to speak to “the other girl.” Another answer girl, Gwynne, sits nearby, reading a magazine. One girl phoning in is marrying another client she met, through Ella, so now the two of them will only need a single account, and that upsets Sue. Ella, Sue’s cousin and employee enters, cleaning the canary’s cage. (Yes, she is immediately seen taking care of sweet animals.) The phone rings and Ella picks it up, immediately slipping into a grand French accent as it is a call for a French restaurant. Then, another call, a mom who wonders if “Santa” can speak to her son. Ella becomes Santa, at least in voice. Another call, Madame Grimaldi, an opera singer who’s voice is fine now thanks to Ella’s home remedy. She is sending Ella a gown, which Ella has nowhere to wear. Gwynn suggests she could put the gown on each time Jeffrey Moss, the writer, calls in, because she is clearly in love with him. She denies having any feelings for him, and then he calls. He calls her “mom.” She takes on an older woman’s voice, and advises the drunken, hopeless writer. Well, “It’s A Perfect Relationship”, because they will never see each other or meet. It’s then that two detectives, Barnes and Francis, enter Susanswerphone. They ask Ella incriminating questions while pretending to be reporters. They discover that Ella does a little modeling in the side. They work for vice, and they are shutting down “lonely hearts clubs.” A call comes in for Madame Grimaldi, and the call sounds very incriminating (in a comic way). Barnes arrests her, when Sue walks in, announcing she is the owner of this establishment. Barnes smugly plays back his proof, the call from Madame Grimaldi, and Ella points out that she is an opera singer of world renown. Barnes, dejected, admits his error. Then, Sandor enters, a man from somewhere in Europe with thick Germanic accents, and Sue’s new boyfriend. Sue says Sandor is her new partner, and he introduces himself as President of a record company no one has ever heard of. Barnes will not give up, and the friendly Francis tries to advise Ella as he leaves. A call comes in for Kramer Music, a club needs a new song quick. Ella knows this is an opportunity for another Susanswerphone client, Dr. Kitchell, a dentist who composes on his drill. Sue yells at Ella to stop getting involved in the client’s lives. Sandor “sadly” takes his leave, as he has a business meeting. Larry Hastings, a producer, calls to see if Jeffrey Moss has called. Ella, imitating a tough producer, says no, but asks if there’s a part in his new film for another client, Blake Barton, a Marlon Brando clone. He makers it clear that Barton would need to show up in a suit and tie, and stop talking with marbles in his mouth. Barton call, she talks beatnik to him, but Sue glares so she doesn’t advise him. Jeff’s apartment, a bachelor pad. A party. The phone rings, and Jeff, a good looking, intelligent guy living a life of easy self-indulgence and drink, gets the call. It’s Olga, a shrill Russian girl who wants Jeff, and wants him to take her to the races. Jeff turns her down for “work,” as the party rages on, even though he should be writing his new piece, “The Midas Touch.” But he knows it’s up to him to get it together, get sober,. And write. (“You’ve Got To Do It”) Hastings calls, and he pretends he’s not in. Larry Hastings walks in on the party. Jeff claims he’s taking a break, the script is almost done. That’s good, Larry says, because it was due six months ago, and the star is in town and wants to read it. Hastings and the guests depart. Jeff calls “Mom” to put in a 7 a.m. Wake-up call, so he’ll get to writing, and she does her best to encourage him. He monologizes on the fact that he’s got to do it “On My Own”, and realizes he can’t do it. In an alley that night, Sandor meets with his “partners”, bookies from around the country, and explains that he has a “Simple Little System” of codes to place bets that the police will never figure out, involving a phony company, Titanic Records, and bookies calling in bets disguised as orders…calling in to Susanswerphone. At Susanswerphone, Ella gets calls with orders for Titanic Records. She’s worked all night, and Sue takes over, though Ella has an important call from Hastings – if Jeff doesn’t have an outline by noon, he will drop “The Midas Touch. Jeff doesn’t answer his phone. Sandor arrives to start receiving calls for Titanic. Sue starts taking orders, too, unaware of the actual nature of Sandor’s business. Carl, the local delivery boy., passes through, and he’s never heard of Titanic, though he’s a classical music buff. He questions Sandor, who bluffs and bullies his way out of it. In the meantime, Ella sneaks out. Barnes is watching outside the building, and stops Ella, who claims to be going shopping. He doesn’t trust her, but she wants to know “Is It A Crime” to be cheerful, to love the world? Of course not, and she goes on her way. Barnes has Francis follow her. She arrives at Jeff’s. He’s asleep on his couch, sneaks in. She looks at him, thrilled. She sees empty paper in his typewriter. She tries to sneak, but he sees her and they talk. He wonders why he wasn’t wakened by Mom, and Ella points out that his phone is unplugged. He plugs it in, it rings, and it’s Sue with the message from Hastings. He’s doomed, starts to drink. Ella gives him a pep talk, and seems to know all about him. (She does, as “Mom”.) She even has his favorite danish in her purse! She calls herself Melisande Scott. She starts looking good to him through his hangover, but she insists he write, though how she knew he was a writer… She forces him to work. She tells him that she believes in him, and it moves him. He starts to type while she watches, and wonders that this is all “Better Than A Dream”. Francis calls Barnes to report Ella was in a man’s apartment. Now they’ve taken a cab into the city. A subway. Ella and Jeff ride, after he’s turned in the outline he miraculously created in hours. He says that she is the miracle. Jeff wants to celebrate with congenial people, and Ella says they are in a car full of them. They do not look very congenial, but as they talk, and say “Hello, Hello There”, the entire city of NYC becomes a happy party. Dr. Kitchell’s office. Ella is now fully working to assist her clients. The doctor, a bit absent minded, starts working on her, thinking she’s a patient. As he does, almost everything she says becomes a song cue for him, and he invents and composes, using his drill. Ella suggests he write a song called… well… The Midas Touch, and he is inspired. On the street outside, Barnes and Francis make a list of men Ella visits, and Barnes concocts ever bigger and more heinous crimes being committed. Outside a drug store, Ella finds Blake Barton, dressed like Brando in The wild Ones, with a bunch of other similar guys, all of them mumbling. (Very funny idea.) She talks their lingo, but tells Barton to try wearing a suit, and he says he ain’t goin’ Walter Pidgeon for nobody. She says sure, be a punk all your life! He’s nothin’! And he’s convinced, he’ll try it. Suddenly, in a high British accent, he’s off to Brooks Brothers. Barnes and Francis make their list, and Francis is disappointed. He thought Ella was a nice girl. Ay Susanswerphone, Gwynne answers calls, Sandor takes “orders.” Ella, subdued, takes over. Carl overhears orders for Titanic, one for Beethoven’s 10th symphony, and he knows that’s wrong because Beethoven only wrote nine. So Ella changes the “order”! It’s time for her to meet Mr. Moss, but she says she’s not going. He trusts her, and she’s been lying. She can’t do it. Then, he calls “mom” to thank her for the faith she’s had in him, and while he’s on the phone, a woman shows up in his apartment – Olga,. And she wants to go to the races. Furious, Ella hurries out the door. Jeff’s apartment. Ella comes in and pretends to be his secretary, pushing Olga out the door and forcing him to work. He admits he’s in love with her, and that he was so “Long Before I Knew You”. She tries to leave, but in the end, she can’t make herself go, and they kiss…as Francis snaps their picture and exits unnoticed. A park, where Jeff waits for Ella. Still cha-chaing, she enters. He tells her Larry loved the writing. There’s a party for the star tonight, and he wants to take Ella. She’s afraid to meet these famous people, part of his world. She thought they were going dancing, just the two of them. So he dances with her in the park, and celebrates how she came into his life “Just In Time”. Larry Hasting’s penthouse, and Jeff introduces Melisande Scott around the room. Ella is embarrassed by the lie. Jeff needs to talk business and she’s left to the barracuda’s in the room, advised by a friendly butler to do as they all do and “Drop That Name”. She does, and is accepted, but it’s all silly. Jeff rejoins her, and has been talking her up, so lots of his friends want to know her better. Alone before dinner, she asks Jeff how he’d feel if she wasn’t what he thought. He says he’s in love with her exactly because she is as he sees her, and offers to take her home, leaving her a moment to say goodnight to the others. Alone, she knows she can’t keep up the lie, sings “The Party’s Over”, and slips away. The Cafe’ where Sandor is stunned. A wrong order! Impossible! The two “gentlemen” from “the Chicago Symphony” insist that he cover the costs of the mistake to the tune of five thousand “albums.” Desperate, he discovers Sue has money and suggests that they run away together to “Salzburg”. At Susanswerphone., Ella is packing. “I’m Going Back”, she sings, to her old job at the Bonjour Tristesse Brassiere Company. But before she can depart, the mob henchmen enter with Sandor, demanding money. Sandor is desperate to find out who changed the order, and Ella cheerfully says she did it. Sandor admits his real scheme, and Sue is horrified. Barnes enters to arrest Ella, but she skillfully allows the man to save face by turning in Sandor and the mob boys, and giving Barnes all the credit. Barnes apologizes to Ella. Ella discovers Jeff’s on his way, but before she can duck out, he arrives. She disguises herself as “Mom”, but that doesn’t work. He loves her, she loves him…and he’s brought a bunch of people connected to her via phone that she’s helped. They parade in, for a joyous ending. Okay, I’m prejudiced. I did the show in High School, and I loved doing it. But I think that you will love it, too! And then we can all be prejudiced together, and the world will be a better place. That said, you probably shouldn’t do this show. 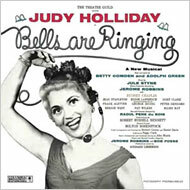 Bells Are Ringing is typical of the better shows written during the 50s, in the midst of what I see as the Golden Age of Musicals (around 1941-1968 or so). It is a Musical Comedy, without any pretensions. Adapted from Cinderella, and the true story of a young woman who worked at a New York answering service, the show is intended to be pure entertainment, and so it is. The people involved in shaping it were all master craftsmen, and the show hums along, gets plenty of laughs, earns a few tears and provides lots of good songs. How could it do less than that with Robbins, Comdon & Green, Styne and Fosse on board? And of course Judy Holliday was one of a kind. So, will it work today? Not very well. We don’t have or need answering services anymore, and I do think that as we move away from that period, as time passes, this show will feel more and more like a museum piece, which is a great shame. It possesses charm and craftsmanship far in excess of many other successful musicals, and a starring role women should be fighting to play, especially actresses with real comic ability, and moving into their more mature years, ay their forties. There aren’t many roles that fit that category, and this is one that works, offers hit songs, and that audiences respond very well to. Perhaps, with the changes we see in technology today, some version of the personalized answering service will again come into vogue. If not, then this musical really needs to be treated as a period piece, late 50s. That will make the music feel at home, as well as the sense of humor, and will allow the story to work, as well as providing the piece a unifying art design. There are other issues that date it. “Drop That Name” has lyrics mentioning famous people at the time the show was authored. They are generally unknown today, rendering the number worse than useless. Barton’s character is a caricature of Marlon Brando at an early time in his career, and though everyone knows of Brando, the reference is very likely to be meaningless to anyone younger than, say 50. The “cha-cha” was a popular dance in the 50s, but no one knows it now. These are just some of the ways the show dates itself and is rendered unproducable. I’m afraid there are more. Is it worth doing? It could be, but not poorly, it isn’t strong enough of a show to survive a poor production, And it won’t survive anything other than a stellar performance from its lead actress. That said, it is an awful lot of fun when done well. But it would have to be done as a period piece, while not becoming camp or kitsch. It must be presented with a clear and humorous heart, the show can’t have a mean bone in its body. Some cuts may be required. “Drop That Name” probably would need to be dropped, but it isn’t a great number, anyway, though it has a few laughs. A few lines of dialogue extrapolated from the song might cover the scene. The book is clever and fun, the characters are endearing, the score is tuneful and memorable. It is a fine show. But I believe that time may have passed it by. The music is Musical Comedy, on the simple side. It is not hard to play, teach or learn. There are nice ensemble harmonies in the big numbers, typical of the period, but really not very hard to do. High Schools used to do this show all the time. Ella – Alto with a grand belt, a fair range, tons of personality when she sings, and an outrageous sense of fun. Jeff – Baritone with a classic Musical Theater lead voice, or at least great charm in his voice. Sue – Character Mezzo, doesn’t sing much,. But must carry a tune. Sandor – Character lyric baritone, must be able to sing with phony Viennese accent. Carl – Young man with a tenor range, principally a dancer but must sing well. Kitchell – Tenor-ish, doesn’t need to be a great singer, but must think he is. Gwynne Smith – Mezzo, some singing. Singer at Nightclub – Tenor, rich, full, warbly romantic voice. Ensemble – Full ranges, big voices, capable of harmonizing well. Again, this is a real dance show. The numbers your choreographer must do include “Bells Are Ringing”, “Simple Little System”, “Hello, Hello There”, “I Met A Girl”, “Mu-Cha-Cha”, “Drop That Name”, and “The Midas Touch”. (I’d cut “Drop That Name”) These will demand a fair range of musical theater styles. But they are all presentational, smile at the front sing-and-dance kind of numbers. The choreography should make no secret that this is a show. “Hello, Hello There” is the oddity, taking place in a subway car, which may allow a choreographer to get very creative. Use the seats, the poles, the doors, have the car start and stop on its journey, people exit and then re-enter because they’re having so much fun, perhaps for the first time in their lives. Make certain your choreographer is a “Broadweay” style dancer, and not modern jazz or something like that. These are Broadway songs, wedded to a story. Ella – Pretty, not “young”, say in her late 20s, 30s. Vivacious, bubbly, inventive, concerned. The actress must be able to comfortably slip into various “voices”, such as “Mom”, “Brando”, and “Santa”. Her ability as a mimic will be key. She must be lovable, likeable, and a bit of a force of nature. Cast for acting and singing, then type, then dance, but she will need top fill all the skill categories, though dance can be restricted for her. Today, any ethnicity. Jeff – Handsome mature man, in his 30s-40s. Must be likeable to get around his drunken womanizing laziness with the audience. In fact, somehow, he needs to make these failings charming. Cast a likeable actor who can sing well, especially romantic pieces from the 50s, a crooner. If he can move well, great. Sue – A character type, maybe 10 years older than Ella, in the same family. Nervous, officious, but a softie at heart. Cast for acting and type, then singing. Don’t worry much about movement. Sandor – Character role, 40s-60s. Slimy, oily, possessed of a kind of put-on charm, but just below the surface a snake who uses innocent people. It would be good if he’s funny, too. Cast acting, type, singing, some movement. Carl – Late teens. Young wholesome delivery boy who just happens to dance like a god and sing like an angel. Cast dance first, voice, then acting, but get the age and look right. Inspector Barnes – 30s-50s. Crotchety, erratic, volatile, over-emotional, overly-imaginative police detective who sees crime everywhere. Everyone’s a perp to him. Kind of a timely character, after all. Non-singing, non-dancing, just get the acting and look right. Francis – Barnes’ assistant, in his 20s. Sweet-natured, practical, prefers to see the positive side of people. Kitchell – Neurotic, perhaps dangerous dentist who composes on his drill…while drilling. A bit of a crazy man, filled with endless bad melodies and terrible song ideas. Anywhere from age 25-60. Acting first, then singing. Could double in ensemble. Barton – Young Brando acting type, but thinner, smaller, not as manly, doomed to fail if he sticks to this image. Perhaps secretly a graduate of the Royal Academy in London? Could be fun. Non-singing, though could double in the ensemble. Larry Hastings – Big producer type, anywhere from 30-60, non-singing role. A bit humorless, a bit of a shark. Gwynne Smith – Works with Ella and Sue. Described in the script as “plump, sedentary.” Could actually be any type, and could be cast interestingly. Can double in ensemble. Olga – Flashy brunette, I’d make her Russian. Can double. Singer at Nightclub – Overly-dynamic, a cartoon-version of a crooner. Ensemble – New York types. All must dance and sing. There are a lot of locations in this show. The Susanswerphone office is used 5 times, and can be used in the opening “commercial”, making it six scenes out of 22. Jeff’s apartment is used thee times. Streets, a park, account for 5 scenes. Make a joke of Francis dragging the streetlamp on and off each time, as Barnes pontificates. Specialized locations include the subway car for “Hello, Hello There” (it can be used again near the end of Act II), Dr. Kitchell’s dentist office with a working drill, the cafe and then the club back to back in Act II, and Larry Hasting’s penthouse. Lot of sets. You should go with suggestive sets. The actual location is “New York City.” Perhaps the set is a unit set, and it’s an NYC skyline, inviting and bustling with action. Leave your center stage open and roll or dance or fly on cut-aways and set pieces to suggest locations. Use streetlamps for the street scenes. A bench with a tree tacked onto the back for the park. The penthouse can be lighting effects, twinkling lights in the faraway towers of the skyline suddenly turn on and well-dressed people enter with drinks, etc, as the lighting changes. In other words, a non-set. Place Susanswerphone in a corner of your apron, up front and to the side. Have it consist of a stationary wall with a door, perhaps a few steps down, a switchboard or two, and a few chairs. Keep it simple. Maybe a few homey touches like flowers. “Mu-Cha-Cha” can then be danced “in one”, on the apron, at the start of Act II. The drape can open revealing a park (a bench), for the “Just In Time” scene. Then, suave well-dressed dancers waft the bench offstage as Larry Hasting’s Party descends, perhaps with a chandelier from the rafters above. These are the sort of changes and the sort of flow I think the show needs top keep moving, and to keep costs down. Clearly, the subway car will need to be center stage, in the large, often empty playing area with NYC shining behind it. It can be made of flats on a rolling riser, with doors that slide open., benches attached (firmly), ans poles. This may be a tricky set, but not too tricky. In general, I’d suggest sets rather than create anything large or literal. I’d establish this as a motif with the first thing we see, Susanswerphone. Jeff Moss’ apartment could be a couch, coffee table with a phone, and end table, and a small desk with a typewriter (yes, that’s right, not a computer). These might be on two separate small rolling risers moved on from the wings, or they could be placed for scene 2 behind the main drape. Just remember that this set does not appear in Act II, and it cannot just sit center during Act I. You can’t place it on the apron with Susanswerphone because then we’d see Jeff all through the first scene as Ella wonders what he looks like. Save the surprise for the drape going up. Period late 50s, probably., Suits and ties for the men, white shirts, black shoes. Dresses for the ladies, correct for their characters. Lots of photos and films are available to show you the styles. This show, overall should not be hard to costume. Ella’s big ball gown can be rented from a shop, even a wedding shop. The high-class dresses and suits for the party must look period chic. New York denizens in the subway could at first look dangerous, deadly, grimy…and then, happiness, lights, and a better look at sweet costumes. All in all, a show that can largely be rented from a good costume shop. Phones from the period. A typewriter. Glasses and trays of food for the party. Kitchell’s working drill. (Or at least a thing that makes sounds.) The switchboard (either you or the Set Designer). Balloons and confetti for “Hello, Hello There”, perhaps. A fake mic for the night club singer. Pure musical comedy, as described above. Think about lighting the subway dark and dangerous, and then bringing up the lights as people get happy. Consider a light-up backdrop of NYC, where the distant office building windows go on and off randomly. Generally, things should be clean, bright, clear, Musical Comedy. Not much special make-up needed. Keep your work unobtrusive. Sandor might have an oily mustache and slicked-back hair. Do make sure the hair styles are right for the period. One way to get some fun out of the show would be to cast real well-known celebs as people who call into Sue’s, characters who are only voices, such as Madame Grimaldi, Mrs. Mallet, Jr. Mallet. These would be pre-recorded, take only minutes to do, and would add spice, a guessing game for the audience that could be promoted. By the way, while in High School, I also wrote a spoof of this show, a nasty (but funny) piece about Adolph Hitler that went over like a lead balloon, and for which, I now apologize. You see, friends, it’s never too late. And I played Sandor in tenth grade. I always got the character roles, never the girl. Mores the luck.